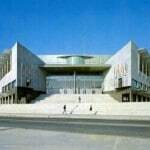 Pavello Olimpic, offically named Palau Municipal d’Esports de Badalona, was built for the summer olympics in Barcelona in 1992. This was the arena of the basketball tournament during the olympics, and since then one of Spain’s best teams, Joventut de Badalona, plays their matches there. This venue holds more than 12,000 spectators, and it is often used for concerts and other events.